This year the State of Israel issued a postage stamp for the Indian holiday of Diwali to celebrate twenty years of relations. The stamp is part of a two stamp set comparing the Jewish festival of lights- Hanukah to the Indian festival of lights. 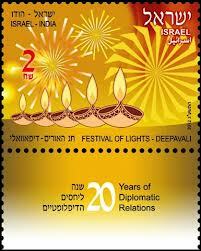 Notice that the stamp actually says Diwali and explicitly compares it to Hanukah. In contrast, when Israel issues Christmas or Easter stamps they just say “seasons greetings” to avoid mentioning Christmas or Easter. and they certainly dont compare the Christian holidays to Jewish ones. Diwali is celebrated by everyone in India as a national holiday. The public aspects were also celebrated by India’s Jews as told in our blog interview with Avi Solomon. Diwali was first celebrated as a public holiday five years ago by the Israeli Diamond Exchange in appreciation of the Indian diamond community’s contribution in making Israel one of the major centres of world diamond trade. 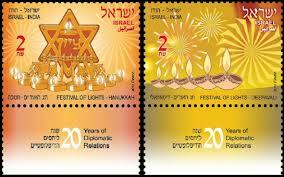 TEL AVIV: India and Israel have released a set of postal stamps depicting their respective festival of lights, Diwali and Hannukah, to commemorate 20 years of diplomatic relations between the two countries. The stamps were unveiled by secretary and director general of India Post, Manjula Prasher, India’s new envoy to Israel, Jaideep Sarkar, and chairman of Israel Postal Company, Sasi Shilo in presence of other officials from both sides. Sarkar called upon to promote close people to people contact among the two countries to foster experience of mutual goodwill and friendship among them. “In India we have a great respect for the Jewish faith, as we have for all other faiths. Today the release of the joint postal stamp not only celebrates a milestone in our diplomatic relations but also a common structural tradition, the festival of lights….both festivals celebrating the victory of good over evil”, Sarkar said addressing India enthusiasts gathered to attend the ceremony. The Indian stamp shows a row of traditional earthen lamps, diyas, representing Diwali and the Israeli stamp features a menorah with the word “Zion” inscribed inside a Magen David star. Hanukkah, like Deepavali, celebrates the triumph of good over evil and the victory of justice over injustice. Emphasising on the deepening Indo-Israel ties, Shilo called upon the postal services of both the countries to also cooperate in order to meet the new challenges posed by technological advancements. “Issuing joint stamps symbolises the culture, cooperation and friendship shared between people and nation”, he said, touching upon the special bonding between Indians and Israelis. These limited edition stamps have been designed by Indian artist, Alka Sharma, and Israeli artist, Ronen Goldberg. They will be available in Israel from today and released in India in about two weeks. The menorah featured on the stamp was inspired by the wooden menorah used by the Jewish community in Bombay. Deepawali or Diwali is certainly the biggest and the brightest of all Hindu festivals. It’s the festival of lights (deep = light and avali = a row i.e., a row of lights) that’s marked by four days of celebration, which literally illumines the country with its brilliance, and dazzles all with its joy. Each of the four days in the festival of Diwali is separated by a different tradition with its own tale, legend and myth to tell. The first day of the festival Naraka Chaturdasi marks the vanquishing of the demon Naraka by Lord Krishna and his wife Satyabhama. Amavasya, the second day of Deepawali, marks the worship of Lakshmi, the goddess of wealth in her most benevolent mood, fulfilling the wishes of her devotees. Amavasya also tells the story of Lord Vishnu, who in his dwarf incarnation vanquished the tyrant Bali, and banished him to hell. Bali was allowed to return to earth once a year, to light millions of lamps to dispel the darkness and ignorance, and spread the radiance of love and wisdom. It is on the third day of Deepawali — Kartika Shudda Padyami that Bali steps out of hell and rules the earth according to the boon given by Lord Vishnu. The fourth day is referred to as Yama Dvitiya (also called Bhai Dooj) and on this day sisters invite their brothers to their homes. The illumination of homes with lights and the skies with firecrackers is an expression of obeisance to the heavens for the attainment of health, wealth, knowledge, peace and prosperity. From Darkness Unto Light…- In each legend, myth and story of Deepawali lies the significance of the victory of good over evil; From darkness unto light — the light that empowers us to commit ourselves to good deeds, that which brings us closer to divinity. Any thoughts on the Diwali – Hanukah comparison? Wow very nice article. Very impressive. Toda Rabba. Honey (being very sweet) is never brought as a korban to Hashem. We are commanded not to include honey in the ketores notwithstanding the fact that if it was included then ‘ein kol adam yachol la’amod mipnei reichah’. The idea of the gates of light of the chanuka lights seems to be more of a perception that you have to and can fight (as the Macabees did) to perceive rather than being representative of a pervasive sweet light that fills life. According to both Beis Shammai and Beis Hillel – ‘noach lo le’adam shelo nivra mishenivra, ve’achshav shenivra yephashpesh be’maasav…’ Life itself is not an inherent accomplishment.